The Protection of the new body armour is better then the older OBO armour, especially around the abdominal and clavicle area. The shoulder pads are shaped to the fit the shoulder and are far more comfortable and best of all easier to move in. 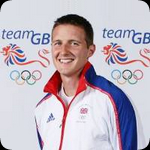 I am of tall stature and feel that the ability to securely tie the armour closer to my body enables me to be more confident in making saves. Overall much better than the older armour in terms of protection and aesthetics. 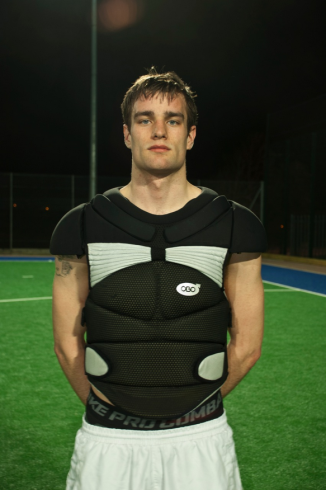 The new body armour offers great flexibility and increased protection to the stomach and chest areas. 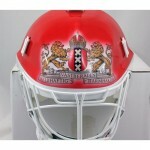 It has a great fit to the body when the straps are fitted tight and sits in the body better than previous body armour. 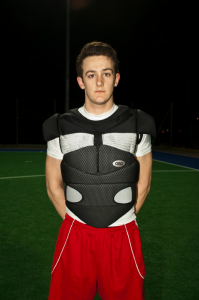 Shoulder and collar bone protection is excellent and a big improvement from previous versions. Having tried which arm protectors fit best with it, I preferred to stay with the the Robo full arm protectors ( though the OBO elbow guards will also work fine. Now I’m no Pamela Anderson when it comes to cup size, but if I did have ‘plastic fantastics’ to look after I would be confident that this piece of kit would look after my investments nicely. I have been using my new chest protection since August 2011 and have a zero bruise count during that time. The armour wraps around the torso giving excellent protection for the ribs. The wrap around means I can safely dive or drop for smothering saves without exposing myself. And let’s face it, no one wants to expose themselves mid game. The collar is more substantial than previous models without being obtrusive, offering improved protection of the clavicle bone. The shoulder cup seems to sit in the right place and stay there while I move around, unlike some where they seem to be after thought pads stuck on top and making some goalkeepers look like Ming the Merciless. 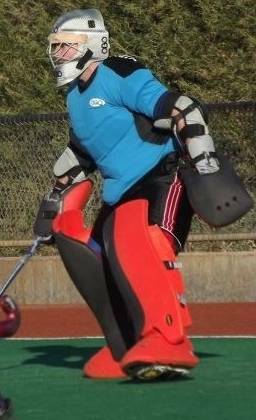 Looks are important, let’s face it, 99.9% of hockey spectators will look at two goalkeepers and assume the one with the best looking kit is probably the better keeper. What makes good looking kit? For me it’s the gear that makes me look and feel more athletic. 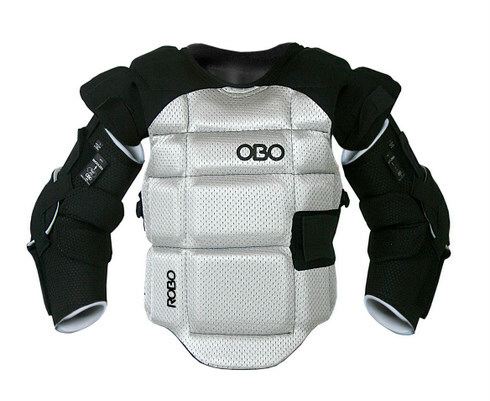 The first time I wore my new OBO chest protection I turned to the nearest person and asked “Do I look slim in this?” I was joking of course. Mostly. The strapping to secure the chest piece is fairly heavy duty elastic which means it will sit flat across your back and not bunch into a thin uncomfortable ridge. It’s adjustable of course and if correctly set up, will hold the chest pad down and prevent ride-up. The only concern for me was the length of the front section. I hear this has been addressed in the latest batch to hit the market. So overall this protector gets a thumbs up from me. At last a GK Top that actually fits me correctly and is light weight. For too long GK tops have been like wearing a flag made of mesh with no real shape to them. The new top feels very supportive and i really like the tight fit. The elasticitiy in the top allows for full freedom of movement. Even when wet the top is still very light. 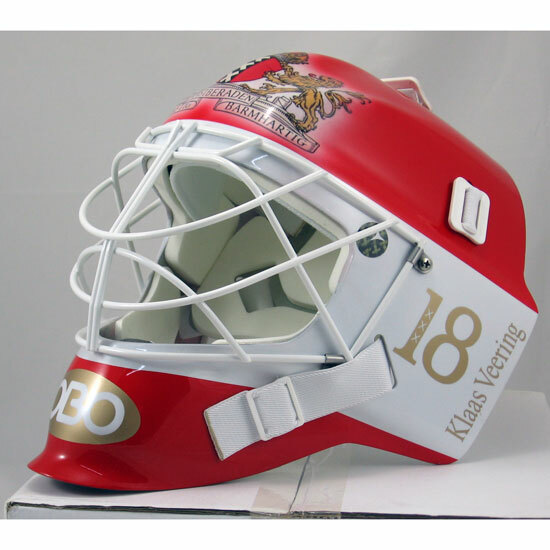 Great work OBO on another fantastic piece of GK kit. 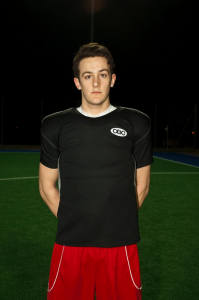 OBO Short sleeve goalie shirt review. So, here it is. The new Goalie shirt from OBO. When it comes to keepers shirts there isn’t a lot on the market that takes my fancy, for the last 2 seasons I have been using a Nike Dri-Fit running shirt which has served me well. I’m always on the hunt for new products and equipment so after sending a few emails to Simon enquiring about testing future products, he came back to me with this. I’ve been using this shirt for many weeks now and I can safely say it is one of the best shirts I’ve worn. It keeps my armour tight to my body yet still has enough stretch in the material for it not to be uncomfortable. 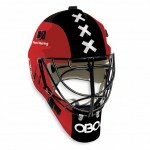 Firstly I’ll start with the style, every keeper wants to look good, right? As you can see I have the Black and Silver top, It is very similar in design to my Nike top which is what I personally was looking for. I really like the 2-tone colour option and as it’s OBO I would expect to see numerous options available, like with the rest of their products. Me and Simon were in discussion about which size would be best for me. We were deciding between a large and an extra large and settled on the XL. If I was to re-order another one I would go for a large as the XL is just a bit too big for me. I guess it’s all down to personal preference, I prefer my shirt to be as tight as possible, whereas others like it slightly baggy. After a couple of weeks, I decided that I would mod my shirt to make it more tight fitting, around the chest and arms. It could also depend on which body armour you use, Iam currently wearing the Mercian Xtreme with the bicep protection cut off. This armour is quite slim fitting with fairly small shoulder caps, some other armours are more bulky which would fill the shirt out more than my one, so take that into consideration when buying! A fairly obvious point to make is that this shirt is definitely not an option for goalies in full body armour as your arm protection will be ruined from diving around. The materials OBO have used for this shirt seem to be of a very high standard, the Black material on the front is stretchy and feels very durable. The Silver material used on the back feels very strong, it almost looks similar to the material of my old long sleeve smock. I really like the idea of having a vented back, but could see others disagreeing. Maybe there could be an option to have the shirt made entirely of the black material alongside the tops with the vented back? Because the material of this shirt is of a very high quality, it hasn’t lost it’s shape, frayed or shrunk in the wash, other shirts I’ve had haven’t held us aswell. 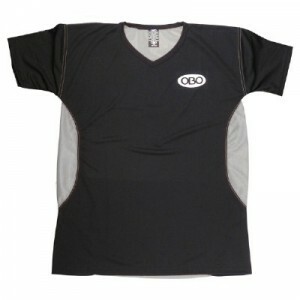 In short, I think OBO are onto a winner with this top, it’s comfortable, looks good and is specifically designed for keepers. Good job guys! This is the style of top that a lot of keepers have been waiting for. 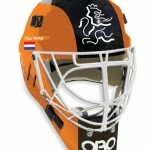 No more ¾ length tops or using a similar style from another sport. 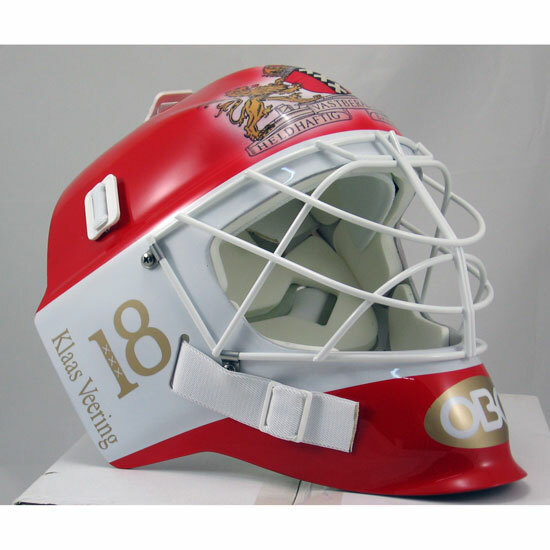 The other company that does this style is Kukri, however they will only normally produce a GK top as part of a team order and they do not have a vented back. For info, I had both GK’s come over from the game prior to mine to have a look and the opposition GK after our game (all in OBO kit, two had a Mazon shirt with the other wearing an older OBO design – silver/black). Also, it received a lot of compliments from my own team. That has never happened before. 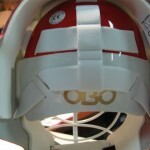 Great integration of the OBO into the number one at the back. However, a lot of GK’s are not number 1; therefore, does this come as an option unprinted? [Admin: we no longer print the number ‘1’ on the back of the shirts]. In addition, I have had this screen printed with my name on the back and the number 1 on the front also. At first glance this top (size L) look really small and figure hugging almost like a muscle top. This isn’t just my view but also that of the other GK’s who have much better physiques – (I will blame age and beer). However, once worn with body armour it really does come into its own. The body armour is kept firmly in place and whilst it is definitely snug it does provide an overall sense of protection. I can only relate to the same way it feels when wearing the stripper pants and overshorts as everything is compact but comfortable. I do not know how much difference is there is between the L / XL etc but would be worth noting the exact sizing details on the sales info. This is definitely a top that is not suitable for the full body armour with arms; however, I believe that is self explanatory when buying a top of this nature. 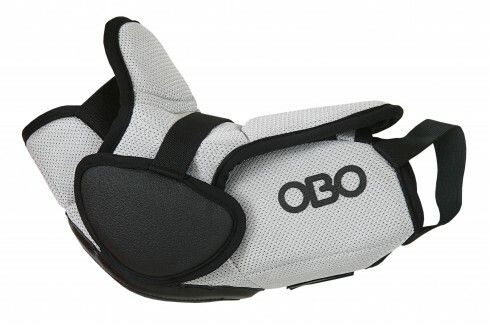 It fits really well with the OBO elbow guards as the fitted arms do not get caught in the guards unlike the sports tops that I wear. Great for me in Australia during warm games however am not sure of the whole philosophy. 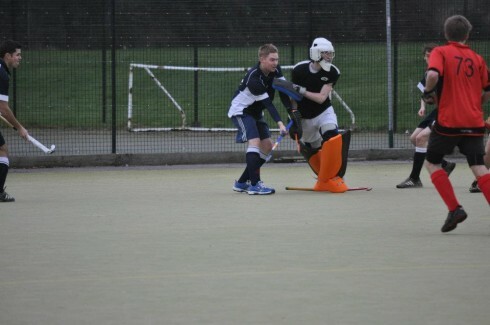 If anything, the back is probably the coldest area on a keeper as the body armour always keeps the front warm. In addition, there are a large number of keepers now wearing Skins or equivalent. I still either use an OBO wicking or skins. The old style GK Tops were always vented being a spin out of ice hockey smocks with the new way being all enclosed similar to outfield players. I am not sure if there are actually any performance differences but am sure you guys have researched it more than I am aware of. In summary, I do not know whether or not it is needed and honestly do not have a preference either way. I absolutely loved this top and consider it by far the best one I have had and surpassing anything that OBO have produced previously. 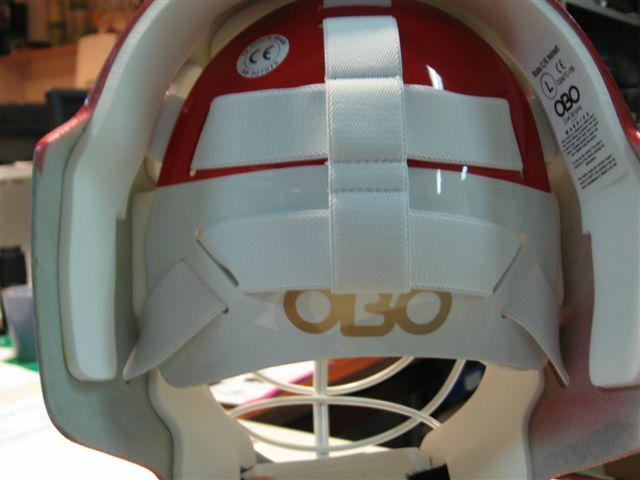 The colour range will be important as it always is with OBO products as different foam colours also play a big part. I’ve just submitted the following reviews to the Barrington Sports website and thought that I’d share them here too. I’ve had the Obo training gear since September 2010 so feel that I’ve used the equipment enough for me to write a well informed review. I have a pair of Deflecta’s, a Flicka stick and a bag of Bobbla’s. This is an excellent piece of training equipment that really helps to sharpen and hone the reactions. It is very expensive in my opinion but that’s what you expect for anything to do with goalkeepers and their kit (economies of scale certainly screw us all here). 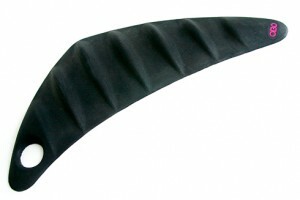 As they are made from recycled tyres, you should expect them to be quite heavy….. and they are! This is great in that they stay put once placed on the pitch but they’re a pain to carry to and from the pitch. As you can’t bend them (because otherwise they’ll break) I recommend you carry them at the bottom of a spare goalie bag with the rest of your coaching equipment or use a couple of ladder lock straps to hang them off your shoulder. I have found that they work better in pairs as they cover more area in front of goal as not everyone is skilful and accurate enough to get the ball to hit a single Deflecta every time. It also gives you option of having the mats facing opposite ways and therefore giving a high and low profile for more unpredictability. I had high hopes for the Bobbla balls but have been very disappointed with them. I was expecting them to be unpredictable and to actually “bobble” about but unfortunately they don’t do either. The only way to have the balls “bobble” about is to use them slowly but this makes them all too easy to follow and kick. If you bring them up to a realistic playing speed, it makes the balls act like a normal hockey ball and therefore is totally readable. I have tried many various ways of rolling, hitting, throwing, bowling and spinning the balls and just do not think that they are worth the money. I feel that there are plenty of better ways of spending £76 on training equipment (price related to www.BarringtonSports.com as of 12-April-2011). My other issue with the balls is that they are made from a very soft plastic compound and they don’t look like they’ll last. Unfortunately for me I train at a very poorly maintained council run pitch and most of the goals have metal backboards. Footballs and idiotic vandals do not mix well with hockey goals and the metal backboards are all seriously dented and pulled away from their frames. This leaves some sharp edges sticking out and quite a few of my Bobbla balls have been damaged with deep cuts. 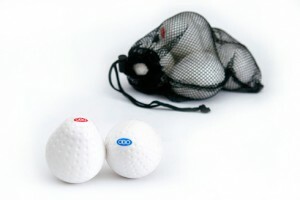 The normal training balls do not appear to have the same problem and are impacting at much higher speeds. In conclusion, the Bobbla is a nice idea that just doesn’t seem to work that well. The Flicka is so much fun! It is relatively easy to use and you can become fairly proficient after a session or two. 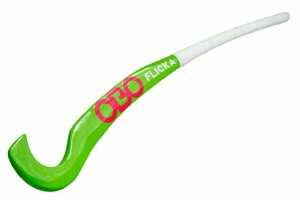 I feel that the most impressive feature of the stick is the way that it is effective at any speed. I am able to lift the ball fairly slowly and accurately in order to train with lower level keepers and then ramp the speed all the way up to eleven when I train my National League keeper. The stick is well made and as it’s made of wood, I’m sure it will give me many years of use (unlike my Obo Fatboy stick which lasted three months before shattering so maybe Obo have improved their quality control). Like any hockey skill, you need to keep practicing in order to get the best out of the stick. Most people will be able to lift the ball within 5 minutes and then build it up to being able to hook the ball high and wide to the left after another 10 minutes. This skill with this stick is being able to flick to the right and you need to learn to open your shoulder and make a deliberate rotation to your right to get it to go that way. Once you’ve got this skill sorted, you’ll be having great fun with the keepers you train. When I first got my hands on the Flicka I hadn’t quite got the technique right and thanks to YouTube and my iPhone I was able to watch the video and repeat the action – easy! I highly recommend this stick for coaches of all abilities and coaching keepers of all abilities and out of the three Obo Training products would rate this as my number one purchase, followed by the Deflecta. Author PhippoPosted on April 13, 2011 August 13, 2014 Categories OBO, Product Reviews, Training And CoachingTags Bobbla, coaching, D'Flecta, Flicka, Kit Review, training2 Comments on OBO training equipment review. 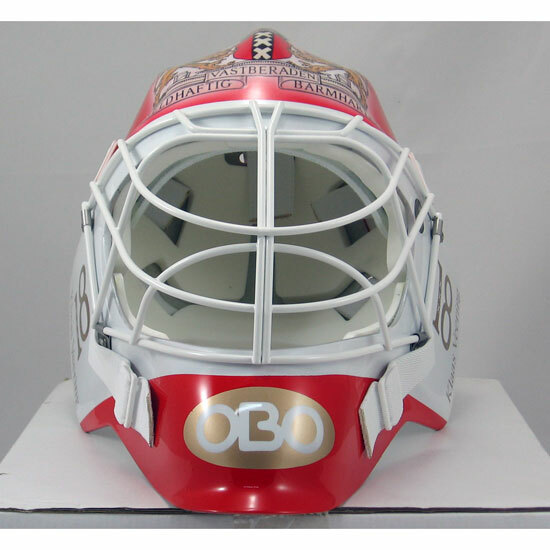 When I started to play with OBO over 15 years ago, I didn’t use the OBO helmet but the icehockey style Cooper helmet. 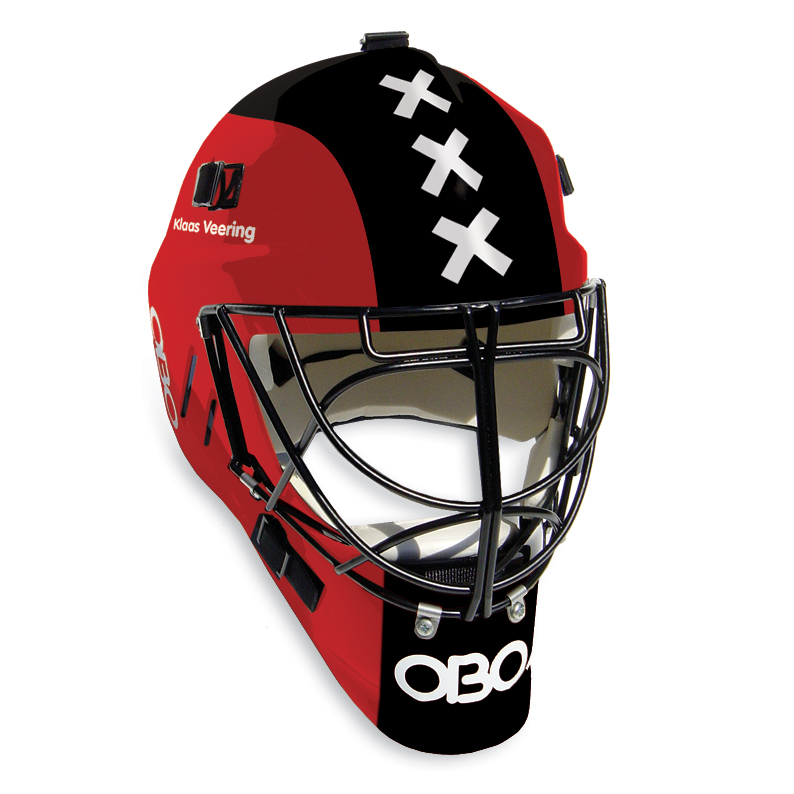 After a few years I tried on the OBO helmet and since then I won’t use another helmet anymore. Protection is really good — I’ve been hit quite some times over the years but my head is still on my shoulders. The newest helmet I use now is pretty heavy. I thought this might be irritating, but when you put it on you hardly notice the weight and because of the perfect fit this gives no problems. One thing I always change when I get a new helmet is the position of the wire cage. I like it better when it is placed a little lower on the helmet than standard — the vision is much better like that. 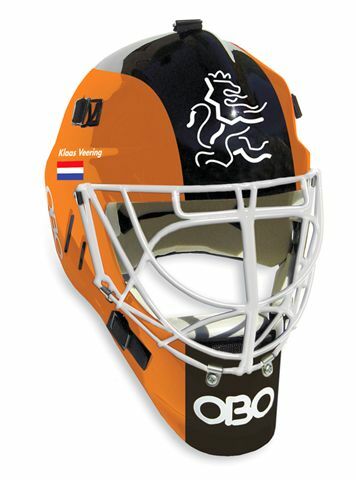 So with help of the nice people at Verbunt (Dutch importer of OBO) I put in some new screws in the helmet. 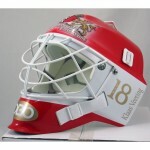 All in all I’m very pleased with the helmet and I can’t think of a better one in the market. 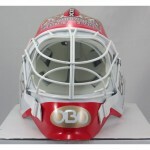 I’ve added some pics of the custom helmets I’ve used. Cheers and a happy new year from Amsterdam! 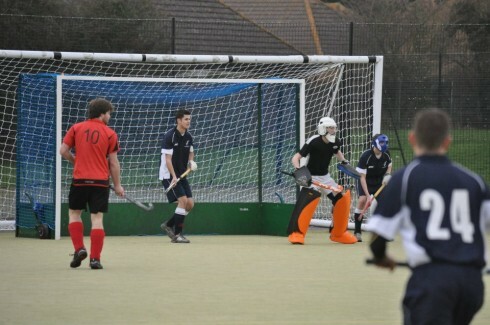 ……….i am 14 years old…and i play u16’s club hockey (Pembroke Wanderers) and I am the second choice senior keeper of my school….. The style of play i use is For short corners I tend to log if its a hit and i stay up when its a drag. And the odd 1vs.1 I tend to slide… and take the crap out of the player. What would be the best for me?